In Ireland before the famine, potatoes, with some milk and pigs could support a population density approaching 10 people per hectare (1). The world now has about 0.5 people per hectare. That’s about 5% of the population density of pre-famine Ireland. The problem is not food (calories, protein) per se. The problem is that the rich (i.e. 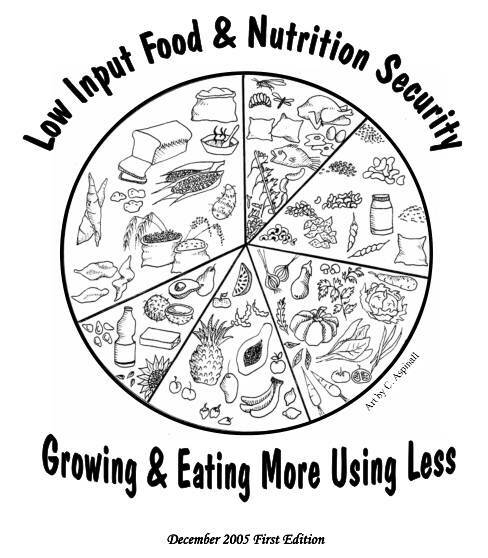 us) turn lots of food growing capacity into not much food at all. Foods like beef and lamb require many more times the land area (and other resources) than fruit, vegetables and pulses. We may also be betting too much on “scientific” agriculture. By “scientific” I mean agriculture that attracts research funding. I got caught between advocates of gardening, permaculture, horticulture recently and three “scientific” professors from Rothamsted Research and the UK Biotechnology and Biological Sciences Research Council. I characterise the gardeners as “the amateurs” and the professors as “the scientists”. Starting with claims the “gardening can’t feed the world” from one the professors I found none of the professors knew anything much about the topic. Low Input Food vs. The Forsight report. Subsequently, I came across a report published by the World Food Programme Malawi, Low Input Food and Nutrition. This contrasts with a recent Foresight Report, The Future of Food and Farming: Challenges and choices for global sustainability published by the UK Government Office for Science. The food system is globalised and interconnected. This has both advantages and disadvantages. For example, economic disruptions in one geographical region can quickly be transmitted to others, but supply shocks in one region can be compensated for by producers elsewhere. A globalised food system also improves the global efficiency of food production by allowing bread-basket regions to export food to less favoured regions. World Food Programme Malawi distrusts this influence of such trade. To get the money for inputs, people sell their crops and animals – the very items that they spent so much time, money and energy to raise! Each year the soil becomes more unhealthy, so each year the farmer tries to buy even more fertilizer and seed. They call this a “Cycle of Dependency”. I am not saying the professors are useless. There is a place for “long chain carbon feedstock” for our food and other luxuries that the first professor emphasised but I fear that relying on the scientists and that may be why the amateurs are raising their voices. When it comes to climate change and especially future droughts (see The Dai After Tomorrow), I’m presently on the side of the amateurs, especially after reading Low Input Food and Nutrition, which describes the vulnerability of the internationally traded cash crop approach. The difference between an amateurs and scientists? The scientists have research budgets. Who granted them the budget? 1. 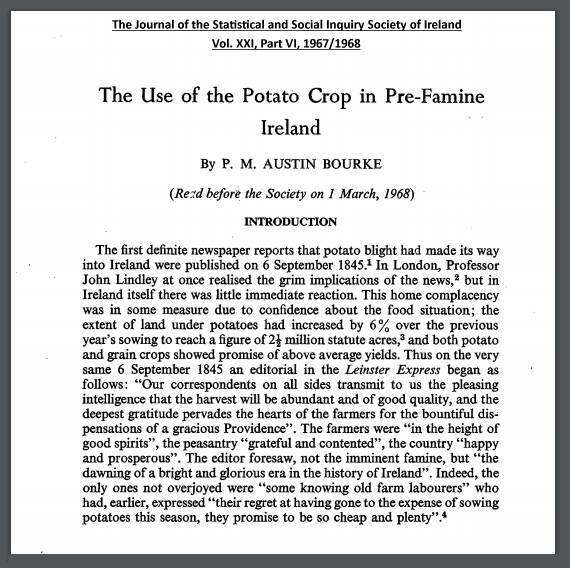 See The use of the potato crop in pre-famine Ireland by P.M. Austin Bourke. I have been reviewing the recent ASPO Conference in Belgium and saw your question to the Agriculture Panel. I’m not sure you got an entirely helpful answer. Perhaps I can provide you with some helpful comment. I have been tracking the subject of ‘Forest Gardening’, this sets out to plant large tree subjects, under plant these with smaller trees, under plant these with bushes, then low growing ground plants – all perennial and each plant type of direct utility to man. The basic idea is to mimic a natural forest canopy at a vegetation climax and so is stable and easy (low energy requirement) to maintain. There are claims that (UK) Forest Gardens have the potential to provide all fresh produce requirements through the year for six (6) people per acre (i.e. equivalent of 14.8 people per hectare) (this compares to one to two people per hectare equivalent for conventional farming). Forest Gardens have the capability to cover production of seeds, nuts, leaves, roots, flowers, young edible shoots – all produced as a succession of mini harvests (indeed once established the main work of Forest Gardens is maintenance pruning and ongoing harvesting (by hand)). I have not got to the bottom of whether this provides sufficient energy to say goodbye to conventional high carbohydrate grain crops (and say hello to acorn bread…). As a Horticulturist also trained in Human Nutrition, I can see Forest Gardening as intellectually exciting (three dimensional farming and energetically highly efficient), but also see this would ask participants to change their diet quite radically (even if this is nutritionally superior). I can share with you, people take great comfort from their food traditions, and getting people to make a change to a Forest Garden diet would be too much to ask for something in excess of 90% of the population. There is an inherent conflict between trees which produce shade and our more conventional annual crops which require good levels of direct sunlight. To address this conflict, I have come up with a planting design which deliberately places large trees at particular locations, which then sets the locations of under planted subjects. The result is controlled access into the plot for light and so allows the remaining space for more conventional annual salad, vegetable and grain crops. The design layout is modular so that a succession of plots can be laid out without trees over shading neighbouring plots. I think this has the makings of a ‘Community Forest Garden’, where individuals each take over one plot and tend it using low energy high productivity approaches. There remains only one serious question about this design – what size of plot to sustainably produce all sustenance needs for one person. This is then a question of dimension. The UK experience of ‘Forest Gardens’ suggests in our Northern Latitude, light is limiting for much of the year, and trees need to be spaced out if each is attain reasonable productivity, compared to tropical examples of Forest Gardens, where closer tree spacings are working well. At the moment my design dimensions are laid out to the 6 people / acre benchmark, this calculates out as a plot of 674.5 sq.m or a plot approximating 26m X 26m. If you have a few bamboo poles and some rope to measure this plot in a park or field this looks generous compared to an typical allotment plot, but when you think it will need to sustain ALL your food requirements for the year this looks tight – but doable. I note on your web site an interest with sustainable farming in developing countries. I think my layout design would work pretty much anywhere in the world, with appropriate adjustments to the dimensions (scarce resources – e.g. water shortage – means wider spacings, plentiful resources means smaller plots should work well), AND adjustments to the plant subjects to those suitable for the local climate and producing foods familiar to the local population. Let me know if any of these thought strikes your interest, in terms of creating urban / peripheral town community gardens where people grow their own food, sustainably and with low energy inputs. In the name of development, these economic reforms opened the way to the large-scale buying-up of land and to the dispossession of a million people. They created a cycle of dependence from which the Bangladeshi peasants have great difficulty in escaping. Along the coast there was a proliferation of shrimp breeding, aimed at satisfying the rapidly-growing market in the rich countries. Bangladesh is today the fifth-biggest producer of shrimps in the world. Approximately 130 companies share the profits from this industry, which employs nearly a million Bangladeshi workers for less than one euro a day. 190,000 hectares of mangrove and fertile land have been converted into aquicultural farms. Land that was in the beginning reserved for agriculture was bought from small producers at low prices, then transformed into shrimp farms, thus accentuating the salination of the land and making it definitively unsuitable for agriculture. This policy was impelled and supported by international agencies such as the World Bank, the International Monetary Fund, the Asian Development Bank, the United States Agency for International Development and the Department for International Development of the United Kingdom. From Climate change and neoliberal policies: the case of Bangladesh, International Viewpoint Online Magazine. Cassava grows in poor soils and with little water. By 2030, temperature rises of between 1.2 and 2 degrees Celsius combined with changes in rainfall patterns “will leave cassava in a class of its own,” the study said. In East Africa, for example, cassava production would increase 10 percent. In West Africa, where it is most widely eaten, cassava will hold its ground, significantly outperforming the suitability of potatoes which will decrease by 15 percent, beans at a decrease of 20 percent and bananas at a decrease of 13 percent.